Battles of Tarain (1191&1192) - The First Battle of Tarain began in 1191 when the Ghurid sultan, Shahăb-ud-Din Muhammad Ghori, invaded East Punjab and captured the Chauhan fortress of Bhatinda. 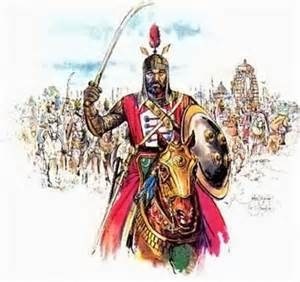 King Prithvi Raj III of Chauhan was prepared for the invasion and marched on Bhatinda with an army of probably greater size (the records of these battles are so incomplete, exact numbers are not known). The two armies met at a place called Tarain near the city of Thanesar. Shahăb-ud-Din launched the first attack hoping to score an early victory. In Persian tactical fashion, his horse archers launched arrows at the enemy hoping to knock it out quickly. But the Chauhan army was to big. It outflanked the Ghurid army on both sides and overwhelmed it. Shahăb-ud-Din had no choice but to withdraw. This allowed him to fight another day. He returned to his capital of Lahore and began making plans for another attack. So confident was he of victory, that he sent envoys to Delhi to demand King Prithviraj's submission. Prithviraj refused. So the Second Battle of Tarain was fought a year later in 1192. Shahăb-ud-Din raised a much larger army and executed a new strategy. He held a large number of his cavalry in reserve and feigned a retreat in the midst of the battle. The Chauhan army gave chase and ran right into the Ghurid cavalry reserves. This time it was the Chauhan army which was beaten. King Privthiraj was captured and eventually executed. The Ghurid Empire was not powerful enough to conquer the entire Chauhan, so it just absorbed its western province.